I've often wondered if some of the dreams that we all have take place not in our imagination or merely 'organic' in nature but if there really is much more too them than this. 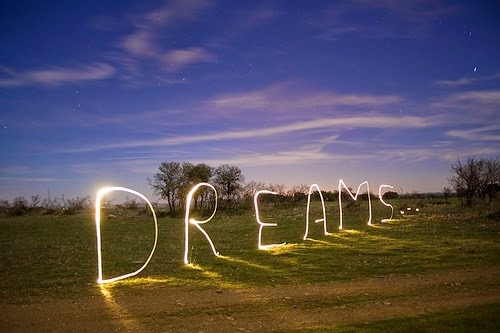 Some of us may of heard how dreams may be symbolic or represent a message we need to interpret. Again I think sometimes there's more to it than even that. I recently had a dream where I ascertained information that I later learned to be true on real life. The information will remain private but I wonder if that in dreams we are interacting with persons from another dimension or reality. This other dimension being sentient of this one. I had 2 really bizarre dreams as of late. 2 nights ago i had one that involved WAY too many people i knew, i forget some of the details but i remember at the end i was really angry with my mother and when i woke up that angry fired back again, i had to stop and remind myself it was a dream. The other dream was a month ago, and i remember it perfectly, it was more of a scene or picture of what i remember, either that or i just remember one scene. I remember it well enough that i could draw it right now. I was on about a 7 story balcony at an apartment complex, my balcony bent into an l so that another balcony was on the other side, but the balcony's were split. I remember across the street was a ball park attached to the schools and i could see the portable classrooms cut off by the apartment complex. I remember it was me on my balcony and about 2 or 3 others on the other one beside mine. And we were all looking at what was a saucer, but the edges of it (about 2 1/2 feet in) was seating and the center of the saucer was up about 1 foot higher so i assumed that's where a driver sat, in his seat with a 360 view. And the saucer was right up to the other balcony and i remember someone either got out of the saucer onto the other balcony or someone from that balcony got in. Than it just zipped away and my dream ended. I believe that dreams exist via the brain, and spiritually in another dimension. I once had a lucid dream that was so vivid and wonderful I found myself asking this question you posted. I was aware that my brain/consciousness was allowed to think while maintaining a completely real and functional world. It was at that moment, when I picked up a single blade of grass, within my lucid dream, and realised that I was floating inside another dimension. We are connected to this dimension through our pineal gland. Which releases chemicals (illegal for some reason) that allow you to peer into this personal spiritual place. Once you are lucid, you will mostly find out your brain wouldn't be able to handle you thinking inside itself while supporting a fully vivid, real dreamworld. I have had numerous Lucid dreams, but two I will always remember, the first I was in a field, the Sun was so bright and I could feel the win on my face. I mean I could literally feel these on my physical body even though I was asleep, in fact they were more real, than in my 'normal' reality. I'll never forget the sun's warmth. Another was similar, but as I was aware I was dreaming I told myself to pick some soil up and taste it a little. (Sounds weird, but I wanted to see how real this dreamworld actually was.) when I woke up I could actually taste it in real life. Strange to say the least. If we carry on after death, I'm sure these are the places our 'soul' or 'brainwaves' or whatever we are left with go to. I'm about as spiritual as they come. Check my threads for proof! But I do not believe we go somewhere else when we dream. When arranging a meditation class for a student, I asked her what she wanted to get out of it. First she said she wanted to work on awareness. I asked her to be more specific. Then she said external awareness. Then I asked for more clarification. Then she said she wanted to get in touch with energies. I asked the purpose she had in mind. She said she wanted to improve her ability to remember and understand dreams. I said "To what external place do you think you go when you are dreaming?" she said she believed that the soul leaves the body and visits higher realms, and hence deja vu and such happen. I do think that that hers is a viewpoint that many in the spiritual community have, but I do disagree. It's not my job to force my perspective upon others. I feel that when we dream, the Conscious Mind turns it's intention to the Subconscious Mind, which plays out scenarios that the deeper Collective Consciousness wishes would be beneficial if remembered and looked at. My interpretation is that Matter is a more dense, more refined, less abstract manifestation. If you break down Matter, you will find that everything is composed of Energy. Energy being less dense, more abstract, less defined, occupies the same space as Matter. If you could break down Energy, you would see the Mind Substance, which is even more subtle, less defined, more abstract. If you broke that down, you would find Spirit, which again, occupies the same space as everything else, simply at a much smaller, more refined level. Finally, you reach the level of highest consciousness, the Divine, where there is no distinction whatsoever, that permeates everything. As such, everything existing simultaneously, occupying the same space, I feel that there is no reason for the soul to actually "go" somewhere. I believe we just turn our minds around to pay attention to a part of ourselves that in our waking hours, gets little to no attention. I myself have certain dreams a lot , reoccurring dreams of a place setting with its own people, the dreams are never the same in terms of what happens, but all the content in the "city" people places/shops are the same , like a looking glass, mostly its my city and places I've been, but things are different, different shops, things like that, and have always thought for a long time that its me "tapping" into memories/thoughts of me in a separate universe where everything took a different path, kind of like the Butterfly effect. but our minds are connected still and a sound theory is that there is an infinite amount of universes , that say if I decide to go left instead of right, the universe splits in two and they both happen at the same time. If someone here could elaborate on that theory, it would be most welcome. So yeah I believe that to be the case, not all dreams certainly but dreams like I have. As for precognition I don't see that as other dimensional, but rather skipping along in "this" dimension.